One of the most common questions we get asked at Casey's is "are you custom"? The answer is YES, we most certainly are! 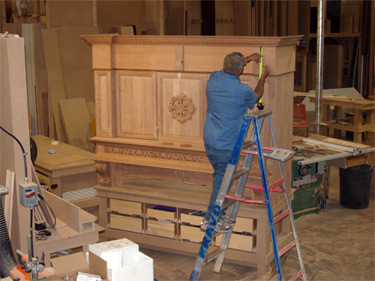 In addition to carrying semi-custom cabinet lines from third party manufacturers, we design, build and manufacture our own complete custom cabinet line in our facility in London, Ontario. Our Casey's cabinet line is extremely versatile - the only limitations are set by the imagination and creativity of our customers and designers! We also offer a 100% water-based finish the first local cabinet company to offer an eco-friendly cabinet finish with superior quality and a lifetime guarantee. We can create anything our clients can dream up any colour, any door style, any finish. So dream BIG...and let our Casey's team make it a reality.